Michelle wrote a sign "Love & Happiness" in 5 different colors with her autograph. It will go on auction later this month. 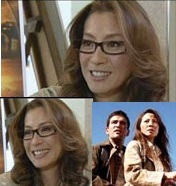 (photos from "Yahoo", "Jcbus", "Eiga", "Nikkan", "CSTV" and "Powerbroad".